Dando Drilling International has been working with geotechnical contractor Bridgeway Consulting to design a new drilling rig for awkward slope applications. Dubbed Ibex, the new machine is track mounted, and is able to do dynamic sampling, SPT and rotary drilling on angles of up to 55°. To ascend, the cables are attached from the outboard winch to a higher point up the hill using the ‘duck bill’ ground anchors. These stay in place when drilling. The machine can then move forward until the exact destination is reached. A scissor mechanism can be used to close any gaps. The track unit uses hydraulic rams to expand or contract from 1.5m wide to 2.1m to offer flexibility when space is tight. A radio remote control system can be used, or a swing-out console with an illuminated digital blow counter is also fitted. The leveling system is the automated Sauer Danfoss Plus+1, and a longitudinal compensating system can handle roll up to 15°. A hydraulically operated walkway provides access to the mast, sample storage boxes and a workbench. Power comes courtesy of a 36hp Hatz silent pack diesel engine, providing 4189Nm of torque at 50rpm for larger diameter drilling, or up to 362rpm for open hole drilling or coring. Drill depth is up to 50m. The China Coal Mine Construction Group Corporation (CCMCGC) in Hefei, Anhui province is taking delivery of dhms’s first four boom all-hydraulic shaft drill rigs. dhms is claiming a number of improvements over conventional pneumatic or semi-hydraulic versions of this type of drill, such as increased drilling speed, quick changes between rotary or rotary percussive drilling modes and improved control. The new design is also claimed to be quieter in operation, and not be prone to lubrication oil mist. One or two custom-built electro-hydraulic power packs on the platform provide the power, all controlled wirelessly. When on undulating ground, the legs can be adjusted hydraulically. For transportation, the rig folds away like a giant umbrella, down to a diameter of 1,900mm. It’s been a busy summer for dhms, as the company has delivered one dh R60t and two dh R75t roadheader machines to Hema Energji, for the Amasra Hardcoal Project at the Black Sea Coast in northern Turkey. They will work at around 700m, mining coal for a thermal power plant. TMG Manufacturing from Tampa, Florida has launched a new drill that is designed to combine both SPT testing and CPT testing in one rig, along with rotary core drilling and auger drilling. The first customer to take delivery was Insuma in San José, Costa Rica, based near where TMG recently opened a new factory. 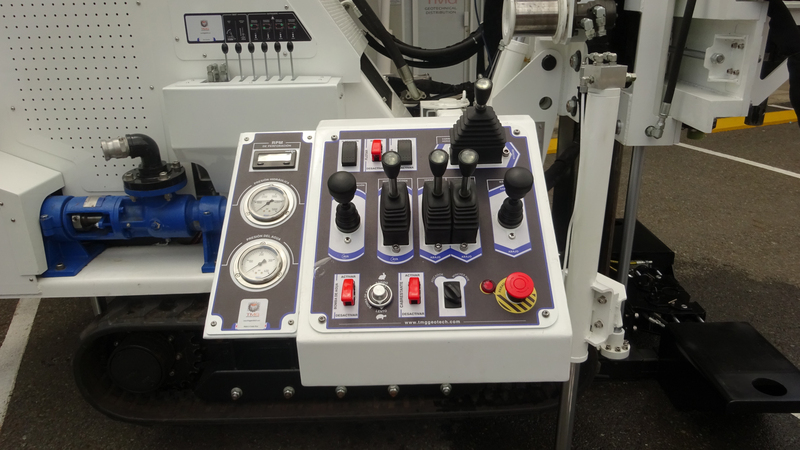 The machine features an 83hp diesel engine coupled to Hawe hydraulics. The mast is of a dual cylinder design, with a 20 ton CPT push capacity and a three-position drill head slider for rotary core drilling and auger drilling. Moyno supplies the integral mud/water pump. The next project on the agenda for TMG is the creation of a junior version of the Crossover Rig featuring a smaller footprint, powered by a 38hp engine. 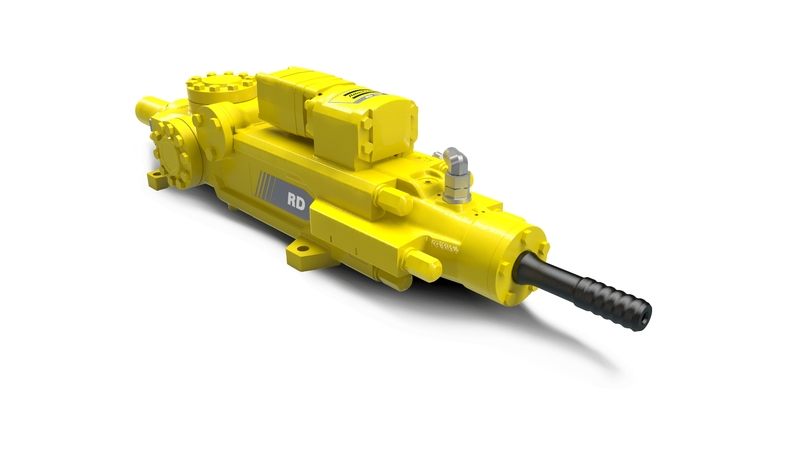 Atlas Copco has launched a compact low-pressure rock drill for use on the surface. To simplify the design and maintenance, the company has reduced the number of parts, using a single internal dampener and a two piece body. Italian company Massenza has launched the M13, an upgrade of the M12. The new machine is more powerful, with a 70hp engine, giving a drill speed of up to 712rpm. Torque is up to 7845Nm. Despite this it is slightly smaller and lighter, and at 2,700kg, is designed to be mounted on a smaller trailer. A safety cage is offered, depending on local legislation, and remote control is available. Drilling methods include direct circulation, SPT, down the hole hammer drilling, coring and augering. Sandvik has added to its DD2710 single-boom hard rock drill line with the launch of the DS2710 rock support drill and the DL2710 and DL2720 longhole drills. The new design, which is mounted on a four-wheel-drive undercarrier, features a FOPS-certified safety canopy, LED lights, and an automated shutdown system in case of emergency. In other Sandvik news, the company has expanded its range of loaders with the launch of the LH204E, a 4.5 ton electric LHD. M-I Swaco has released Screen Pulse, a new fluids and cuttings separator. The company claims installation of the pneumatic device will recover up to 30bbl per day, with average cuttings waste reduced by 20%. 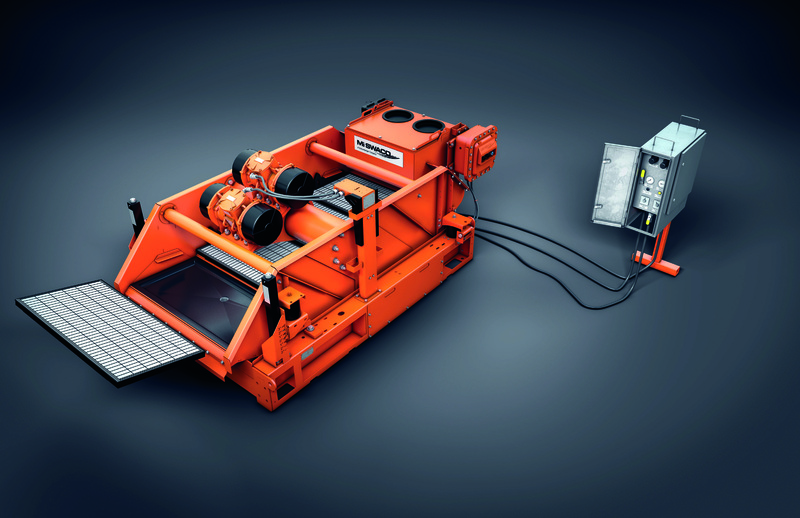 Guy Arrington, president, M-I Swaco, says, “Combined with our shaker technology and lightweight composite screens, the new Screen Pulse separator maximises drilling fluid recovery and generates drier cuttings. This reduces waste handling and disposal and overall drilling costs.” The system can operate up to four shakers at the same time. Hanging rocks: scale or fail?